Did you know that a number of prominent scholars believe that the Jehoash Inscription is authentic? 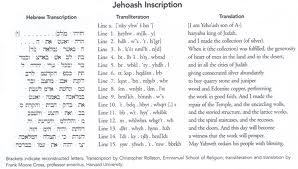 Some of you might be saying, “Back up, I don’t even know what the Jehoash Inscription is!” Jehoash (also referred to as “Joash”) was king of Judah from 835-796 B.C. He is perhaps best known for being the king who initiated repairs on Solomon’s temple (2 Kgs. 12; 2 Chron. 24). The Jehoash Inscription (JI) is reputedly a royal inscription from the time of King Jehoash detailing the repairs that were carried out on the temple. It consists of 15 lines engraved on a black stone plaque. The inscription has similarities with the descriptions given in the biblical texts cited above, especially 2 Chronicles 24:8-14. A copy of the translation is given below. For a clearer picture of this translation, go to the following site from Biblical Archaeology Review (BAR) and click on the photo to enlarge it. If this inscription is authentic, it would be a discovery of momentous proportions! Unfortunately, the Jehoash Inscription is shrouded in controversy. Among other problems, it was not found “in situ.” That is, it was not found in an official archaeological excavation, but in the collection of an antiquities collector named Oded Golan. Because antiquities are “big money,” scholars are always suspicious of objects that come from the antiquities market. Are they forgeries, or are they authentic relics of the past? The problem has become more complicated as criminals become more adept at making a forgery look like the real thing. If an artifact is not found in its ancient archaeological context, then it is open to suspicion. The Jehoash Inscription was only one of several objects included in Oded Golan’s collection accused of being modern forgeries. The most famous object of this collection was the James Ossuary which included the provocative inscription, “James the son of Joseph, the brother of Jesus.” An ossuary is simply a “bone box” where the bones of the deceased were placed after the desiccation of the flesh. 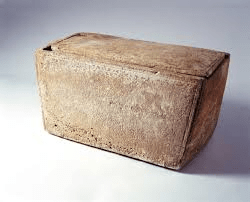 Such bone boxes were only used for a limited time in Israel’s history (1st century B.C. 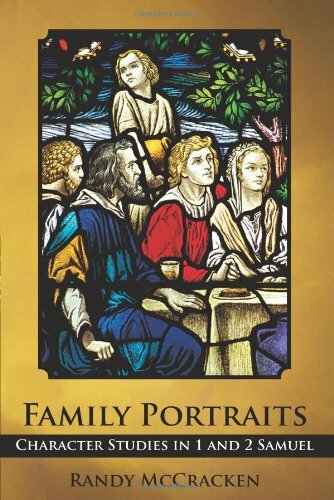 through the 1st century A.D.), which happens to correspond with the time of Jesus and the early church. As a result, this ossuary and its inscription caused quite a stir. Charges of forgery also began to circulate. All of this came to a head with the indictment of Oded Golan and 3 others on December 29, 2004, and the confiscation of the supposed forgeries. The long trial finally concluded on March 14, 2012 with Golan’s acquittal. An account of the court’s decision, as well as details on the supposed forgeries (which many were convinced were authentic) can be found at BAR’s website at this location. Even though Golen had not been convicted, the Israel Antiquity Authority (IAA) demanded that the contested objects be kept and not returned to Golan. However, this demand was overruled and all of the objects, including the Jehoash Inscription, were returned to Golan who plans to put them on public display. More information of the possible authenticity of these items and the decision to return them to Golan can be found at the following site: Return the Jehoash Inscription. Is the Jehoash Inscription Authentic? This is a question that I am not qualified to answer, but the response of many of those who are qualified seems to be leaning in the direction that the Jehoash Inscription is indeed authentic. Besides the BAR articles sited above, the interested reader may also consult the following articles: for a detailed account of authenticity see: Archaeometric evidence for the authenticity of the Jehoash Inscription Tablet. Hershel Shanks, the editor of BAR has recently written another article supporting the authenticity of the Jehoash Inscription. It can be found in the July/August issue of BAR, 2014. For a summary of Shanks article you can click on the following site: Generation Word Bible Teaching. It is unfortunate that questions of authenticity surround the Jehoash Inscription and, perhaps, always will. If it is authentic then it is the only royal Israelite inscription ever discovered. Moreover, it would be further evidence for the temple of Solomon, and it would confirm the biblical accounts of this event. Although we may never be certain of its provenance, the Jehoash Inscription is reported to have been discovered near the eastern wall of the Temple Mount in what is an old Muslim cemetery. This would certainly be the vicinity in which such an item would be expected to be found. If this is accurate there is a certain irony to the discovery of the Jehoash Inscription. It is said that in recent years the Muslim cemetery has been used for the burial of several Palestinians who were killed in suicide attacks on Israelis. 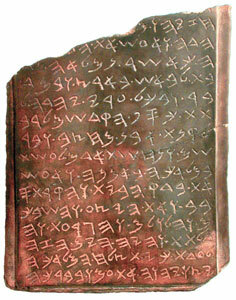 It was during one such burial that the Jehoash Inscription was reported to have been discovered. Therefore, it appears that the burial of a Palestinian militant led to the discovery of an artifact that further testifies to Israel’s historic claim to the land. God certainly works in strange ways!